This morning at 10am, Professor Eyebright was found laying on the floor in his dining room in a pool of his own blood. Unfortunately, he had expired during the night. 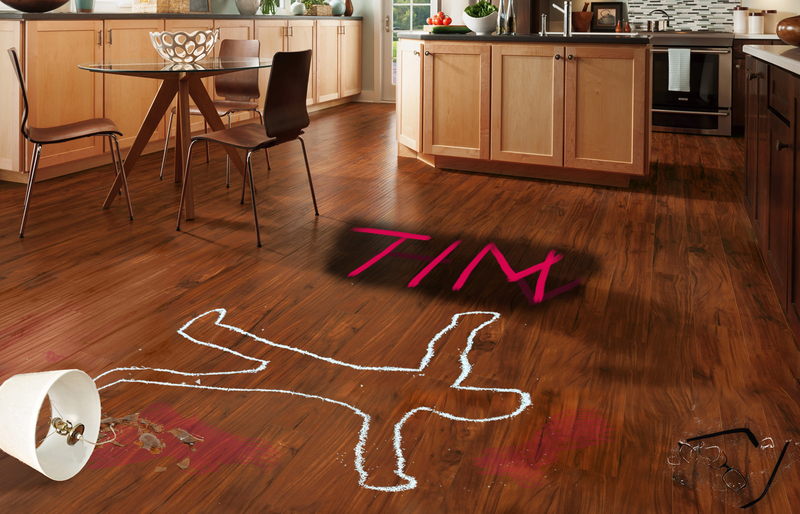 The wife was heard arguing with her husband the day before about Timothy's position. She was not happy to have a live-in graduate assistant even though he was the best in the class and was so valuable to the Professor that he was about to get a promotion. Thomas Jr. was in his room supposedly sleeping at the time of the murder. Harry had a history of aggressive behavior, but had never gotten in trouble with the law. Mary was very kind, although she had a proclivity toward taking various household trinkets; Terry had previously decided to let the matter go and keep her employed. And written in blood was a message that appeared to be the word "HI" with an arrow pointing to himself. This cryptic message baffled the crime scene investigators, but they took a picture of it and posted it online, hoping that someone could solve this riddle to lead to the killer. Using only the clues and information given in the riddle (there are no tricks or unmentioned people), who killed Professor Eyebright, and why? And what does the message written in blood mean? All clues under "The only clues to who..." are directly or indirectly relevant. All point to the answer of how to solve. Without the included picture it would be way harder to solve. Someone asked if it was Harry's initials. Harry's last name is Naborsen. However, I can tell you that this is a cold path. Try another avenue, although I can't say if the killer is Harry or not. It may be, it may not be. When solved, the killer will be obvious. Look hard at the clues. It will take some creative thinking/work to solve. The professor was trying to write the killers name down but couldn't see because of the blood in his eyes. The H is really a t and and i with the t cross too far to the right. The I and arrow are his attempts to write an M without seeing (he was trying for |\/| and some of it was shifted). since a lamp was used, it probably was not premeditated. Perhaps the professor told him that he was going to have to let him go because of the argument with his wife and Timothy went off the deep end? would Harry call the police and not the other 4 who were supposedly in the house? That indicates Harry was in the house. (Unless of course it was a conspiracy with Harry and someone else involved). That is some nice Rustic Premium Laminate Flooring! Not sure if that's relevant, but ya know. the maid, since the murder weapon was of the type of item she would like to take/would often be holding. Terry let the thefts go, but Mr Thomas Eyebright hadn't. Perhaps he saw a theft, took offense, and was killed with the intended stolen object. Harry. Are "HI" his initials? (@Riddler says they aren't, so scratch that.) How did he know to call the police if he wasn't doing something he wasn't supposed to? The weapon - a lamp - indicates an unpremeditated murder, matching Harry's bouts of aggressive behavior (which I assume can "flash" on him). Harry called the police and (presumably) not the occupants of the house. This isn't necessarily a clue against him, but it could mean he was in the house (Professor Eyebright's) when he made the call. Professor Eyebright was hit in the eyes with something bright. Not sure if this is important, but noted for now.